Every day, children are born with muscular dystrophy and adults are diagnosed with ALS and other life-threatening diseases that take away their most basic freedoms - like walking, talking, eating, hugging, and ultimately life itself. 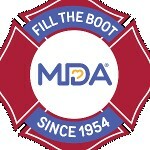 I'm raising money to help MDA fight back! The money I raise will help children and adults in our community, and will also help support innovative research to change the future for people with neuromuscular disease.